I sucked it up in the end and charted out the continuation of the colour pattern into short row shaping for the shoulders. It wasn’t so bad in the end and the result makes it worth it. I got my scissors out on Thursday and cut the steeks for the neck- and arm-holes. I have to say that I deliberated the cutting for at least an hour. If I cut and it was wrong, then it would be horrible, even impossible, to salvage. I might not have enough wool to finish it off. I might run out of time trying to fix it. Obviously, sitting around looking at my steeks wasn’t doing anything to improve the time situation so in the end I just cut the darned things. …And I am amazed to report that it fits perfectly. Maths actually works sometimes! I’m nearly finished one sleeve and then there’ll just be the other sleeve and the neck band to do. “Just”. Is there a penury worse than ribbed sleeves? I really enjoy how your knitting, and especially your knitting mistakes, can always teach you something. 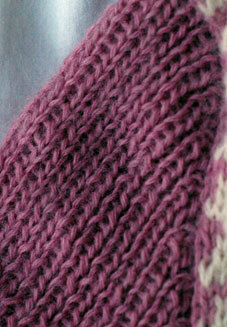 For example, on my Kidsilk Aura cardigan, I learned that there is an optimum depth for a cross-over! On my grey cardigan with the pearl buttons, I learned how to make those short rows on the shoulders totally invisible (after the fact, unfortunately). On my latest project, I have learned that you can never take gauge too seriously. It’s navy, it’s big… it’s gotta be… a jumper for my dad! 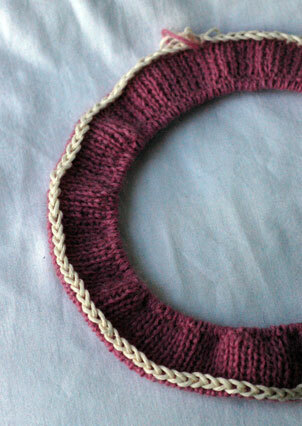 I knit my swatch, measured 5 stitches to the inch, cast on and off I went. Too big. Started again. Still too big (when I say too big, I mean, four inches too big). Recalculated. Restarted. Still too big (three inches). Recalculated. Restarted. Still too big (two inches). Howled in frustration. Tentative query from Alb. Emotional explanation of swatch versus actual knitting. Logical engineer-like suggestion that swatch (“sample area”) was too small and therefore “margin of error” was too great. Calmed by logic. Reassured that sanity is still intact, if a little inattentive. Returned to swatch. Remeasured over carefully pinned out area. 4.5 stitches to the inch. Cast on 25 stitches less and finished the back to the underarm last night. Collapsed in heap of relief. I came to a conclusion on the pink’n’white – it involves some graphing out to get the colourwork to fit into my short rows right so I am going to leave it until this evening. Although that means purling for the shortrows, I think it will be worth it. It will all make sense when you see it!! Calimari are like onion rings except they’re slices of squid. They are rubbery and squishy and honestly, it’s all I can think of when I pick this guy up. You would never think it but they are arm- and neck-holes. All will become clear in the cutting! I am faced with a decision to make about the shoulders. Will I work an extra bit of shaping in the main colour only? Or will I make the shoulders square? Every fibre of my being says to put in shoulder shaping but I am a little worried that working it in the main colour will look a bit odd. 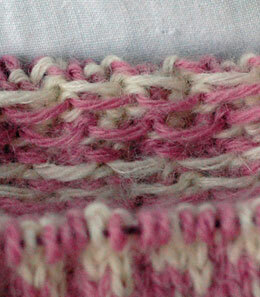 Even I am not crazy enough to jump into short row shaping whilst maintaining a colour pattern. Well, maybe I am, but not today. The more I think about it, though, the more I wonder if it would look sort of nice, joining the main colour collar to the main colour sleeves. If you feel strongly one way or the other, I’d like to know! I still haven’t made up my mind. 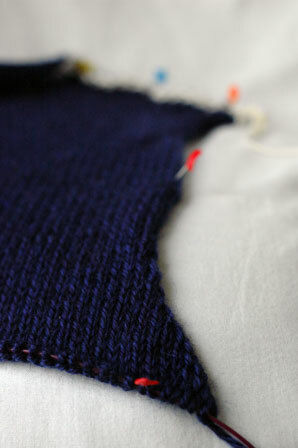 For reasons that I cannot explain, I decided to finish up my Kidsilk Aura cardigan this morning. 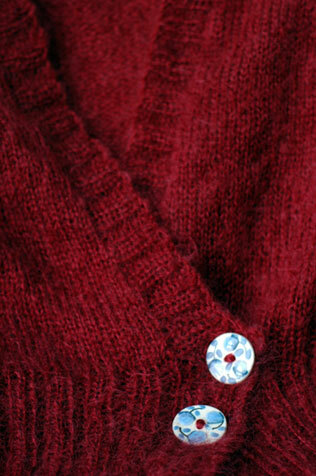 I will get a modelled shot tomorrow when I have time so for now, you’ll have to be content with the buttons. The way it fastens at the front was a complete surprise but seems to work very nicely. I made overlap for the button bands a little too low so the front sections were flapping about a bit. That sort of style looks good if you’re 6’6 and can get away with wearing nothing else but the sweater and jeans, but not if you’re 5’5 like me and prefer clothes to function properly. So instead of buttoning straight down as intended, it’s doing a criss-crossy thing that holds everything in place and doesn’t flap about at all! That’s all I have to show today because I have been mostly working on the pink and white thing. I really ought to start my dad’s jumper for Christmas because his arms are longer than there are days left before Christmas….! I have been orchestrating something at the shop that will be lots of fun and should bring a touch of excitement to some lucky knitters in the new year. All will become clear very soon! I love knitting, don’t you? 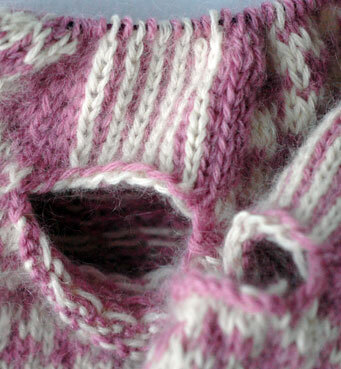 These days, there is nothing I love knitting more than colourwork. After three days of grinding out 20cm of 1×1 rib (that’s 8 inches to you and me – I treated myself to a new measuring tape in Barcelona and I have been thrown into the world of centimetres ever since. I quite like it, I have to say, it sounds like you have knitted much more than if you were knitting in inches! I do realise how silly that is, by the way)… I finally got to crack open my contrasting colour and I haven’t looked back since. I think I am already at the underarm but I am going to double check before I do anything rash. I am going to hurry along with this today, mostly because I am dying to see what it will look like! I would like something smaller to take the edge off, though. I have been thinking about this. And have you seen the new Twist? It is delicious. I have two other ideas I want to swatch for, too… I have been putting off thinking about them directly in the hopes that the swatches will surprise me. It’s the little things, guys! I did a lot of knitting this week but unfortunately none of it went anywhere. I must have restarted this about six times. I wouldn’t have minded so much but I am insisting on using a tubular cast on which, for the amount of stitches I need, takes about 45 minutes to do each time. The white cotton is the provisional cast on that I haven’t undone yet. Even now, I’m not entirely certain it will be the right size but it looks a lot better than my previous attempts. My mistakes were mostly due to being tired, not being able to count correctly at all and forgetting that a tubular cast on will eventually double the number of stitches you’ve got (it took me two gos to get around that one). Sigh. Hopefully the next time you see it, it will be a picture of half a sweater and not a picture of pink yarn burning in a bucket in the garden. To make up for the lack of substantial knitting, here’s some Colinette that I bought from Yarn at the Knitting & Stitching Show. Isn’t it yummy? 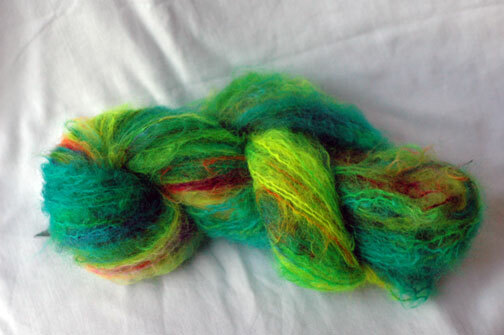 I think I might use it for the yoke of a sweater. Today, I am going to go to the gym and when I come back, I am going to knit and knit and knit until it is time for James Bond. I may even knit through that. I just want to knit something and not have to keep restarting! !